If the newsletter below can not be displayed correctly then click here for the online version. Click here to view the latest Roof Video Update. This week we took a short flight from the East London airport to River Park and circled above the building a couple of times to see the progress from an aerial perspective. We were once again reminded of the huge size of building, but also about the enormity of the project currently underway. You will see from some of the attached photos the positioning of the new roof, and perhaps it will help put the whole thing in perspective for you. Studio A measures approximately 75 x 108 m, giving 8100 square metres of floor space. During this week we have also received a number of different prophetic words over the facility over which we are super-excited! The vision God has given is becoming clearer by the day, and the studio is truly going to be the centre, or ‘hot-spot’, from where the gospel is going to be sent throughout Africa and the rest of the world. Part of the prophetic statements confirmed the future influence Faith Broadcasting Network is going to have especially on the youth of the nations, and already film companies who need studio facilities have approached us; take have approached us into consideration that the medium of film is specifically geared to reaching young people! So, looking at the construction progress we stand in awe, not only at the vision of God, but also at the unfolding of a Divine plan designed to reach the lost. Being so close to the completion of Phase 1, we have now decided to have a countdown on the budget until we reach zero! Our past updates have always shown the amount partners, who have joined in the vision of seeing God’s kingdom extended, have pledged; to date the budget needs a mere 9,22% to be fulfilled! This translates to just under R2,8 million. We gratefully praise God for this. The team of Faith Broadcasting Network is extremely privileged to have so many like-minded people at their side and is honoured to call them friends! We praise God for such faithful partners. There are daily calls and emails from people all over the world who are pledging support, both in prayer and finances, for the project. We know that God commands His blessing where there is unity, and so together and united we believe to see the entire renovation completed on time. God always provides necessary resources when He gives a vision to accomplish much for His Kingdom. Our vision is plain and simple - Go out and train everyone you meet, far and near, in this way of life, marking them by baptism in the threefold name: Father, Son, and Holy Spirit. Then instruct them in the practice of all I have commanded you (Matthew 28:19-20 MSG). This is the exact mandate of Faith Broadcasting Network and its partners! Thank you again for heeding the voice of Christ and partnering with us to make this commission a reality. Thank you for your continued support in prayer and finances - we value your partnership greatly! To give you some practical insight into the timeline of the project, and also to help you pray specifically for each stage in this phase of the development, here is an anticipated timeline (we will keep updating you with the latest news as the plans unfold! 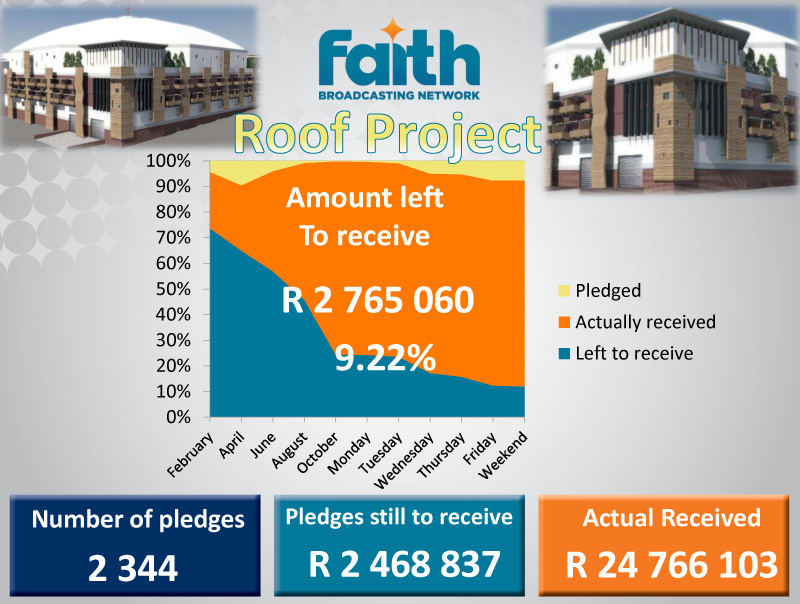 If you would like to make a donation into the Studio Roof Project please click here. • Vacating of Studio A (old) and removal of all broadcast equipment. • Renovation of Studio B as the interim main broadcast studio. • Removal of ±100% of the old wooden floor and shuttering put in place. • Casting of ±98% of the new concrete floor now completed and shuttering in place for the last sections. • New steel girders and beams put on to the floor, ready for erection; some structures already bolted into place. We have started an exciting new project called the Partnership Wall. You all know us by face, yet there are very few of you that we know by face! We would like to get to know our partners better, and that is the reason we are embarking on creating the Partnership wall. If you are a partner with us, please consider sending us a photograph of yourself; you can do so by email, Facebook, Twitter or even using the postal service! Send your best photo, so selfies won't really work! Your photograph will receive a place of honour on the Partnership Wall and we will regularly feature it in our programmes. It is a point of connection for us so we would love you to be a part of this. If you are not already a partner, it is as easy as 2 clicks... go to myfaithtv.com, click on "PARTNER CONNECT", fill in the form, and you will be redirected to attach your photograph. Then click on "SUBMIT". Copyright © 2015. Faith Broadcasting Network. All rights reserved. You're receiving this email because you signed up for the FBN or My River Newsletter or attended one of our live events. If you would like to unsubscribe please click here.